Who is this " Sunshine " lady? Cheryl Schuler aka Sunshine of Hunter, North Dakota. In 1998 a machine quilting shop owner went to a class on Brazilian Embroidery and an addict was formed. Sunshine started a small retail BE shop, Brazilian Elegance, to help supply her addiction. Demonstrating, hosting stitching groups, teaching and designing began. In 1999 Brazilian Elegance and JDR Brazilian Embroidery became JDR Brazilian Elegance. In January of 2000 Sunshine developed the web site: www.jdr-be.com , the first website to bring Brazilian Embroidery to the world. Sunshine, for JDR, develops her own designs and purchases other designs and copyrights them for JDR-BE. Sunshine writes/re-writes all of the directions and draws all of the graphics for those designs – putting " Sunshine " in every design. Sunshine does all the web work, promotion, advertising and marketing of all JDR's products. Sunshine joined the BDEIG in 1999 and became extremely involved in 2001 when she was elected to the position of Seminar Chairman Elect. She was the Seminar Chairman for the seminar that was held in June 2003. Some say it was the "Best seminar they ever attended! ". Two years of intensive work resulted in a seminar to be proud of! She was the "Past Seminar Chairman" and was a member of the seminar committee for the 2004 seminar. She continues to work hard at promoting Brazilian Embroidery and the BDEIG! Wrapped In Stitches and two other small companies were purchased and JDR expanded – exploded! A few years ago, Sunshine purchased another company and will be re-introducing 35 wonderful designs that have been "missing " for several years. JDR-BE now not only produces and sells it's own designs but most other designers patterns too! Cheryl Sunshine Schuler wrote " Sunshine’s Treasures, Book 1 ". Sunshine has also written a "How to do Brazilian Embroidery book" , Brazilian Embroidery 101 and Sunshine's Fantasy World. Currently she is hosting an on-line tutorial/class for the very beginners . Sunshine also has bad eyesight and tends to not have her glasses on when she needs them......so she makes everything in her directions and the web site so she can see them. BIG! Sunshine travels to other communities for teaching and demonstrating. She has been certified to teach Brazilian Embroidery. She has successfully completed a Canadian-American Instructors Course and is qualified to teach Brazilian Embroidery. Sunshine and Larry work and live in a schoolhouse, have a son, Jonathan, two married daughters, and three grandbabies and two wonderful son-in laws! Now how exactly did the " Sunshine " come about? 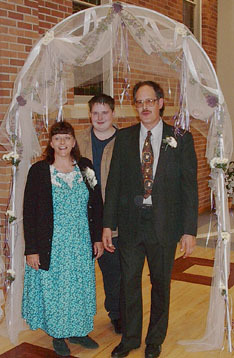 Larry and Cheryl married in 1979. Larry called Cheryl " Sunshine " from the very first date. They celebrated (2004) their 25th anniversary! The 30th is coming soon! Sunshine loves hearing from you about your stitching projects. Ordering Information Shipping Fees Terms & Payments Back Orders/Special Orders Returns Where is JDR Brazilian Elegance?